The GrabCAD Community is driven by the spirit of collaboration and as such, we strongly encourage you to upload models you've created. Sharing your work in the Community is not only a good way to give back, but it is also a great way to get feedback on your work and build an online portfolio of your skills. Uploading your models can help other members save time and can help showcase your talents to your peers. 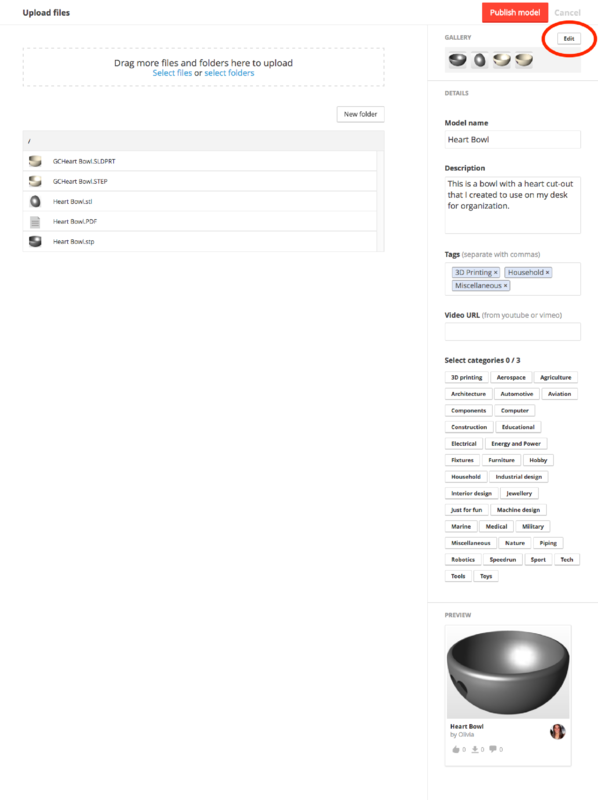 Navigate to the Model Library page, and then click the red ‘+ Upload' button found in the top-right corner of the page. Drag and drop your files and folders into the outlined box or click 'Select files' or 'Select folders' to add files with your file browser. Be sure to add your native CAD files along with a neutral version, to be the most helpful. Name: Make it short and descriptive, double check spelling and grammar. Description: You should answer a few questions like why you created this project and how others can use it. The more details, the better. Tags: Think of keywords that members will use when searching for your CAD model. Video URL: If you created an animation or tutorial, add the 'Share' link from YouTube, Vimeo or other site that hosts videos online. Categories: When people search, what categories will you want them to see this model? Choose up to 3. On the bottom right you can preview exactly what your model will look like in the library. 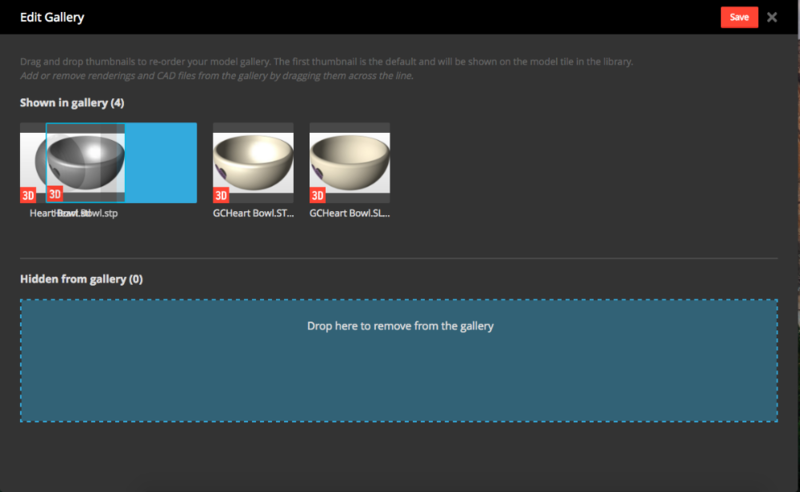 To edit the order of your renderings as well as set your default rendering click 'edit' on the gallery section. In the gallery section you can drag and drop your renderings (and CAD files) so that they are displayed in the order of your choice. To set your default image, drag it to the first position. This will be the image that represents your model in the library. Be sure to click the red 'Save' button when you are finished organizing your renderings. Tip: You see a preview of your gallery (including the order) on the 'Upload' page. You can use this to double check any gallery changes you made! Once your models have finished uploading your model click the 'Publish model' button on the top right corner of the page. Some renderings can take longer to process so it will give you the option to let them finish in the background.